Freelancers are changing the way small businesses operate, allowing small or one-man operations to compete with larger companies. Recent statistics show there are 53 million American freelancers (representing 34 percent of the U.S. workforce) and demand is steadily growing. In fact, over half of micro business owners (those with 10 employees are less) employed a freelance contractor or 1099 employee in the past year. These small business owners are turning to freelance websites to get services that range from logo design and copywriting to social media marketing and online SEO. 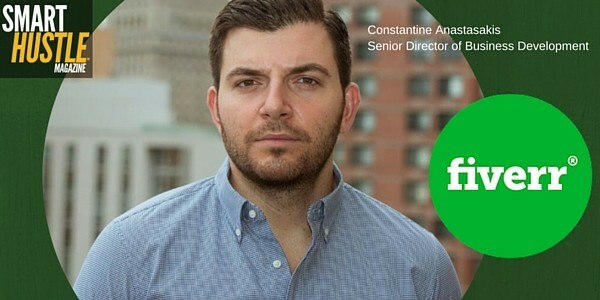 One popular freelance platform is Fiverr, and in a recent interview, I spoke to Constantine Anastasakis, Senior Director of Business Development at Fiverr, about how the platform works and what benefits it holds for small business owners. A recent Smart Hustle article talked about the growth of the on-demand economy, so if you haven’t caught up with the trend, this interview may just convince you that working with freelancers can give you a competitive advantage. Fiverr is a marketplace where freelancers can offer their services and business owners can find skilled professionals to help them with their business tasks. The website calls itself “The marketplace for creative and professional services” and chances are if you need a specific task completed, you can find someone who can handle it on Fiverr. The freelance categories include graphics & design, digital marketing, writing & translation, video & animation, music & audio, programming & tech, advertising, business, lifestyle and more. Freelancers on the platform are referred to as ‘sellers’ since they are selling their services and expertise. When Fiverr came out about six years ago, it got a considerable amount of press for offering $5 services - $5 to design a logo or $5 to write a blog post, for example. However, Constantine tells us that the website is not restricted to $5 sales. Freelancers have the flexibility to package and price their services however they want, so you’ll find $5 and $10 services as well as upper-level services that cost hundreds or more. Small business owners who use the site are called buyers because they are buying specific services from freelancers. Many of the services available are linked to marketing and branding, but you can find tech, finance, legal, and other services as well. An interesting point is that the term ‘small business’ can be applicable to both buyers and sellers. The platform is a magnet for small business buyers who don’t have many employees but need specialized tasks completed. However, many of the sellers also consider themselves to be small business owners, using the Fiverr platform to grow their freelance business. In this way, Fiver is a platform that connects small business owners on both sides of the equation so each can grow his or her own business. If you’ve never hired a freelancer, you may be worried about how and if the relationship will work out. Luckily, when you use a platform like Fiverr, you have a ‘referee’ so to speak in the middle of the transaction, helping to ensure that everything runs smoothly. To find a freelancer on Fiver, simply explore the services listed or do a search to find someone who can do a specific task. Fiverr has an online reputation system that will allow you to learn about and narrow the pool of candidates. This includes a star rating system, individual comments and feedback, and the ability to view a portfolio of their recently completed work. This takes one part of uncertainty out of the equation because you have a lot of information to base your hiring decision upon. When you decide upon a freelancer, you pay the money upfront – but Fiverr acts as a middleman. They hold the money until the service is delivered and accepted by you, at which point they pay the freelancer for their work. Fiverr has made sure that the platform and transactions run as smoothly as possible - which is important because the site sees over one million transactions between buyers and sellers each month. Constantine’s bonus tip for ensuring your transaction goes smoothly – build a long-term relationship with your best freelancers. Freelancers who deliver quality work will get to know your brand through repeated assignments, so you’ll have someone you can trust and rely on when new tasks come up. Want an even clearer picture of how Fiverr can work for a small business? In our interview, Constantine walks us through the fictitious example of “Becky’s Bake Shop” explaining how this fictitious brick-and-mortar store can get started on branding, marketing and developing an online presence using freelancers on Fiverr. Listen to the Fiverr interview below. There is a reason the freelance market has been growing so steadily, with freelancers predicted to make up 40 percent of the American workforce by 2020. That reason? Growing demand from small business owners because the relationship works out perfectly. For one, by hiring an independent contractor instead of a full-time employee, a small business owner can keep costs down by not having to pay benefits like health insurance, 401K, overtime, workers compensation, and so on. The ability to leverage a community of hundreds of thousands of talented people across the globe. The ability to find very specialized skillsets that would otherwise be hard to locate if you confine yourself to your local area. The ability to scale up or down quickly. Avoiding the overhead of an office and complications of infrastructure. The ability to move quickly and efficiently on your projects. The ability to find capable people to handle tasks so you can focus on what you need to do to build the business. You can also rely on freelancers indefinitely. Until you really NEED someone to be at your physical location with you during regular 9-5 hours, freelancers can take care of all your tasks without you needing to find full-time employees.